Halogen type light source ca out put all wave lengths of visible light (400mm to 750mm) power fully and consistently. Using withlight guide various lighting patterns can be achieved while saving space. They are the most common light source to process images. 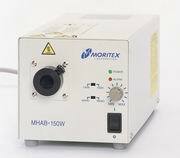 Moritex fiber optic illumination systems are the leading choice for machine vision systems manufacturers and end users world-wide. Our MHAA light sources provide stable (&plusnm;1% illumination stability) cold light illumination. Certain models also include digital remote control and self-diagnostic capabilities. You can control light by selecting REMO on the switch on the font panel and suplying DC0-5V analog voltage from outside. You can control light by selecting REMO on the switch on the font panel and conecting an external switching signal and 10 KOhm volume. You can turn off the light by inputing a DC 5V signal from outside. Burn-out lamp is detected and a signal is outputed. A signal is outputted outside when the lamp is on. If the lamp'selectrical current overflow, the lamp will immediately turn off. If the temperature around the lamp passes a safe level, the lamp will turn off. If the lamp exchange door is open, the lamp will turn off to prevent electric shock. If the temperature around the lamp passes a safe level, the lamp will turn off. A shutter unit with a light source device can be opened and closed when DC 24V (0.32A) is supplied. MHF-V501 very compact and Lightweight Lightsource. This Unit costs the least and lasts the longes of all our models. 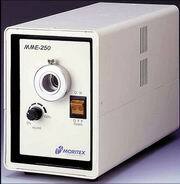 MME-252 Very high Power Lightsource, flicker free due to DC power supply. Achives more than 270 000 lux on the object 50 mm away from the end of a 2000m Fibre. The Lamp House can be used when there is little space to install the Lightsource. 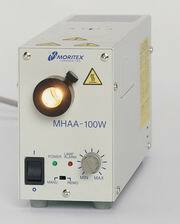 Lightcontroller suitable to control a battery of Moritex Light sources.